"Nelson and Johnny were excellent workers. They worked so hard and never acted tired or "done" with the hard work. They were very..."
Nelson and Johnny were excellent workers. They worked so hard and never acted tired or "done" with the hard work. They were very nice young men. Virgil Ayers even stopped by, I wish everyone could have a boss like him. I am very proud of his workers, it is such a nice feeling!Thanks for everything! "The products you use and Mr. Virgil Ayers. We received several proposals for our project. Ayers Systems was not the lowest bid..."
The products you use and Mr. Virgil Ayers. We received several proposals for our project. Ayers Systems was not the lowest bid. It was Mr. Ayers' professionalism, knowledge of product and procedures. Along with his eagerness to be helpful is why you were awarded the contract. Thank you! By Arlene & Eugene P.
"The crew was hard working and polite!" The crew was hard working and polite! "Good Job- Bruce is an excellent worker with excellent personal skills,"
By Sara & Elaine D.
"Customer service was impeccable! We were impressed with the communication of all involved." Customer service was impeccable! We were impressed with the communication of all involved. Some people dream about vacations or retirement – but not Virgil. He dreams about the smiling faces of satisfied customers. And there are a lot of them! 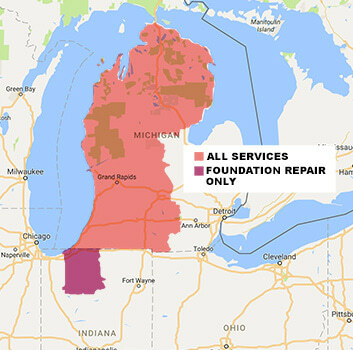 Virgil has personally worked in thousands of basements and crawl spaces, and Ayers Basement Systems has helped more than 25,000 Michigan homeowners. Virgil founded his company in 1981 and, based on his experience working for a concrete forms manufacturer, he decided to specialize in concrete restoration and waterproofing. The company joined the Basement Systems International Network of Waterproofing Contractors in 2006. 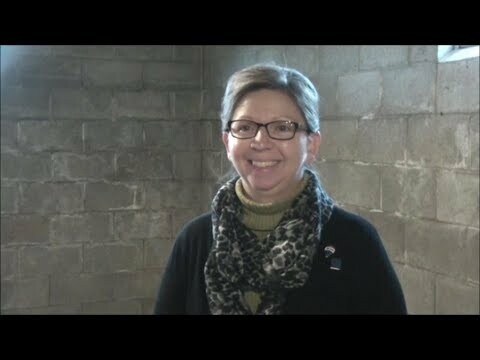 Virgil is a licensed contractor with significant expertise in basement waterproofing and foundation structural repairs. He also is a long-time member of the National Association of Waterproofing and Structural Repair Contractors. In addition to rescuing customers from distressing issues in their homes, Virgil takes an active role in the training and supervision of Ayers’ sales, service and production staff. “I make sure that each of our employees is knowledgeable about the installation process as well as focused on WOW customer service. Every individual on our crews is someone I would be comfortable with doing work for my mother,” he says. A long-time resident of Grand Ledge, Michigan, Virgil is active in the Greater Lansing, Michigan community. He enjoys traveling, sailing, scuba diving and camping. PowerBraces are designed to stabilize failing basement walls. Unfortunately, as time goes on, concrete walls begin to crack and our customer Charles H. witnessed just that. Based on their material, concrete walls allow moisture to seep into basements and cracks just make it easier. We used our FlexiSpan to repair the crack in his wall. FlexiSpan seals the crack and has a built in backup strategy in case the seal fails. Also, FlexiSpan, as its name suggests, is flexible. It moves with the wall so no amount of wall movement will cause it to leak again. In Okemos Michigan, a homeowner was having problems with their crawlspace, so they gave us a call. We drove to their property to check it out for ourselves, after inspection we decided that CleanSpace would be perfect for their situation. CleanSpace is a 20 mil thick plastic liner that fits to the crawl space to completely seal the home from the earth. Polyester cord reinforcement allows for a lot of durability, to make it last longer than the home will. This liner also contains an antimicrobial additive to prevent mold. CleanSpace is the perfect mold fighting technology for any crawlspace. Now, this homeowner will be worry free about their crawlspace. The WaterGuard french drain system is installed around the perimeter of the basement to catch any invading water. It then transports the water to the sump pump where it is pumped outside and away from your home. CleanSpace does it again and makes a crawl space look 1000x better. It works as a vapor barrier to keep it dry, brightens it up and is sturdy enough to allow boxes to be stored on top. If you're having trouble with a flooded crawl space or just want to make it look more appealing we have you covered. Our friends Ron & Sue from Battle Creek, MI were having issues with one of the walls in their basement bowing outward. With continuing observation, the couple could tell the walls condition was progressively getting worse. The crack in this wall grew to nearly half the horizontal distance of the entire wall. Ron & Sue became observably frightened about their walls future and called us in search of professional advice. To help this couple start the New Year out right we went to their home and devised a complete solution consisting of three PowerBraces. The PowerBrace system encompasses adjustable steel I-beams that secure to the joists above the foundation wall, offering revolutionary support. The PowerBrace improves the condition of bowing and cracked walls by reversing the forces of nature and allowing them to move back to their original position. With this sound solution in place, 2019 means no more foundation worries for Ron & Sue. A customer from Orleans wanted help with her floors that were starting to droop. We gave her a free estimate and then decided that we need to install Smart Jacks underneath the floor (in the crawlspace) to reinforce the structure of the floor. The SmartJack is a support system used to stabilize and level the floor joists in a crawl space. This system can support up to 60,000 pounds. The SmartJack system is placed on strong concrete fillings that have replaced the soil in that small location underneath the SmartJack. Now this homeowner should never worry again about their droopy floors. This home was built near a lake and the customer wanted to protect their crawl space. The customer called in our team of experts to encapsulate and transform his crawl space. We installed CleanSpace and our SmartSump sump pump. The combination of these products ensures water and moisture do not seep in through the dirt floor or poured concrete walls and is pumped out immediately.